Bengaluru Bandh - 6 Oct '12, a photo by teshionx on Flickr. 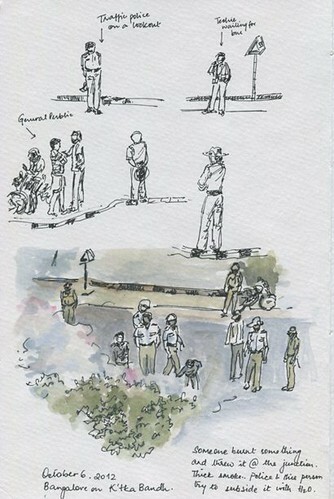 Taking a break from my moleskine sketches, I am posting the sketch I drew on the Bandh day. There was a statewide bandh declared last Saturday, the 6th of Oct, as a protest against release of Cauvery Water to Tamil Nadu. The roads were more or less deserted. Public transport was called off, and cabs too had to stay off the road. 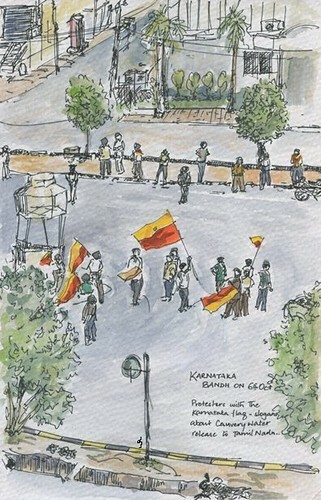 I drew the mob that held the state flags and stood on the junction on Outer Ring road, shouting slogans. They looked a little disturbing, though the whole thing was carried on smoothly, barring when they lit something and threw it right at the middle of the junction. Then, all I could sense in my heart was a slight fright.. There was some smoke from something that was set afire. It looked pretty disturbing, but was well contained. Maybe a cloth or something.. There were cops on the road on the junction right in the front of my house. I sketched a few people out on the roads too.. There were just a countable few women on the road on Saturday. They, too, disappeared by around 10 am. I drew as fast as I could. Added some color to the flags, and then waited for the coast to clear so I could paint the rest of the scene. It was a cloudy day, thankfully!